Here we are, days away from the Super Bowl and Brady weighs in with additional comments on Deflate-gate. Not only did he not know the balls were deflated. The accusations hurt his feelings. I don’t know about you, but growing up in a testosterone-laden house, it is unthinkable that any of the males would have admitted to having hurt feelings even if they did have their feelings hurt. But there was Tom Brady – three-time Super Bowl-winning quarterback. Two time Super Bowl MVP. Standing at the news conference and sharing his feelings. The new man in action. I should be thrilled that a man has stared his feelings, I know. But this feels more like a manipulation than a genuine baring of the soul. Categories: Sports | Tags: deflate-gate, Football, Super Bowl, Tom Brady | Permalink. “Winning Takes Care of Everything”. Thanks, Nike. Good to know. I can now stop telling my kids that personal integrity, character, making things good, and not getting into a mess in the first place are all essential parts of being a person with integrity. Categories: Blog, News, Sports | Tags: Darwin Awards, golf, Moron in Advertising, Nike, personal integrity, sports, spots, Tiger Woods, Winning Takes Care of Everything | Permalink. Did you know that every baseball in Minor and Major League Baseball is rubbed with a special mud before it is put into play? Yep. The mud is from a secret location on the Delaware River. It’s been in use for more than 75 years. I know it’s true because I’ve got a jar on my shelf and I’ve personally spoken to the Mud Guy. 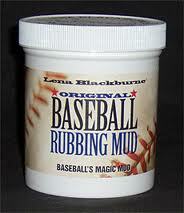 The mud, Lena Blackburne Original Baseball Rubbing Mud, does not discolor or stink up the ball. This was a problem with earlier mud that was used on the balls. In fact, one such ball killed a player after a pitch cracked his skull. The ball could do this because it was so difficult to see. Also difficult to control because of the accumulated gunk on the ball. A brand new baseball is very slick. It’s difficult to grip – sort of like an ice cube. Unless the pitcher can control the ball and the batter and other players can see the baseball, it’s a difficult situation for them all. Enter stink-free secret mud! Now when you hear them shout, “Play Ball,” on Opening Day, you’ll know the secret of the pitcher’s grip! Categories: Blog, Sports | Tags: Lena Blackburne Original Baseball Rubbing Mud, Mud Guy | Permalink. I am personally very grateful that I don’t get the Oprah Network. If I did, I would most likely have had a stroke when Lying Lance proclaimed that the definition of cheating is something that gives you an advantage. Since “everyone else was doing it,” he wasn’t cheating. Then again, if I had one minute added on to my life for every time I have told my kids that “everyone else is doing it” means squat in this house, I might just have been able to survive that moment. Tom Verducci was one of the first to cover steroid use in baseball. He has also been consistently against steroid use, being very clear that he considers it cheating. It’s pretty obvious that I also consider it cheating. And as a parent with kids in sports, it concerns me that the records they are trying to live up to are records that have been attained by using substances that are unhealthy, but I digress. Here’s a link to a recent Verducci piece on steroid use in baseball: To Cheat or Not to Cheat. So – Do you think testing is going to make a difference? Do you think using steroids is cheating? I’d really like to know your opinion. Next up: Some other sportswriters to check out. Categories: Blog, Sports | Tags: Lying Lance Armstrong, Oprah Network, steroids in baseball, Tom Verducci | Permalink. NASCAR driver and Go Daddy girl Danica Patrick has the pole position for the Daytona 500. The “Great American Race” is a 500-mile race that is run in Daytona Beach, Florida each year. That means 200 laps with cars racing at speeds of about 183 mph. Having the pole position means that Danica’s speeds in the qualifying time for the race puts her at the front of the pack on race day. She will being the race in the first position. It’s taken Patrick years to achieve this, but years or not, she is the first woman to earn this starting position. Here’s to the Daytona 500. Here’s to Danica Patrick. Danica Patrick led one entire lap at the Daytona 500 – a first for a woman – before finishing 8th overall. Jimmie Johnson finished first, with Dale Earnhardt Jr. finishing second, and Mark Martin coming in 3rd. Categories: Blog, Sports | Tags: Danica Patrick, Daytona 500, NASCAR, The Great American Race | Permalink. I love long form narrative. I love to read it. I love to write it. I love sports – especially baseball. Especially pitchers. Mariano Rivera is one of my all-time favorites. I love Tom Verducci – the finest sportswriter today. Hands down. So – Here is a link to an unbelievable piece about Rivera by Verducci. What could be better for the day after Valentines? Categories: Blog, Sports | Tags: Baseball, baseball pitchers, Long Form Narrative, mariano rivera, Marino Rivera, Narrative, Narrative nonfiction, Relief Pitcher, sports, sportswriter, Sportswriting, Tom Verducci, Verducci | Permalink. Lindsey Vonn, 28, was airlifted to an Austrian hospital today after a very nasty crash/fall on the Super-G run at the Alpine World Championships. Here’s the video for a closer look. Needless to say, most of us do not have legs that flex forward in quite that way. Neither does Vonn, who will be out for the rest of the season. The question is, will she be back for the 2014 Olympics? Either way, sending out a heartfelt OUCH to Lindsey Vonn. Categories: Blog, Sports | Tags: Alpine World Championships, Austrian Hospital, Leg injury, Lindsey Vonn, Olympic skiier, sports, Super-G | Permalink. 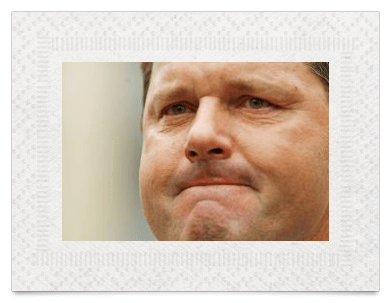 So evidently Roger Clemens is a cheating liar. Thanks a lot, Roger. It was bad enough when Clemens went from the Sox to the Yankees. But as for cheating? Can I just say that I was satisfied with the explanation that his longevity was due to the fact that he put Ben Gay in his cup. That would certainly be enough to push me to extraordinary accomplishments year after year! I applaud the baseball writers – Love You Verducci! – for refusing to vote the newly eligible players into the Baseball Hall of Fame. Not only do I have zero interest in the records set by guys who cheated, I have no intention of shelling out my hard-earned money to take my kids to ballparks to watch cheaters play a game I’ve loved since I was a little girl. Categories: Blog, Sports | Tags: Baseball cheating, Baseball Hall of Fame, Baseball Writers, Cheating Sports Figures, Roger Clemens, Steroids, Tom Verducci | Permalink. So Lance Armstrong lied. The dreary weather matches my dreary mood. It’s not even that he used whatever he used. It’s almost not even that he had a fairly elaborate system in place to do what he did. It’s that he lied. Repeatedly. I know. As an adult, I’m supposed to be ready for people to lie. It’s not supposed to shock me. But it does. And since I take it personally, it disappoints me, too. I honestly expect that once someone is caught cheating, that person will step up and admit it. With Armstrong it’s even worse. Not only did he choose to lie – casting aspersions on others along the way. He waited to come clean until he wanted something else badly enough to make admitting he cheated a priority for him. To me, that makes his admission worth about – I don’t know – exactly zip? So Lance is a fraud. A big lying fraud. Thanks a lot, Lance. And now Lance wants to compete in other sports. Nice try. I will not waste one second watching Lance Armstrong compete. Ever. Again. Under any circumstances. Believe me when I tell you, I’m not lying. 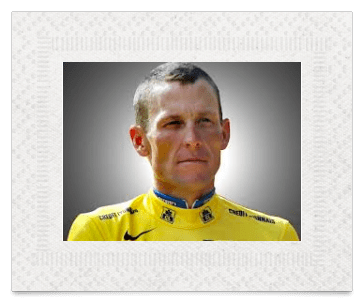 Categories: Blog, Sports | Tags: Armstrong Doping Report, Cheating Sports Figures, Lance Armstrong, Steroids, USADA Protocol | Permalink.